While in Mumbai we stopped over at the Woodside Inn in Colaba and tried all the local craft beers they had on tap. 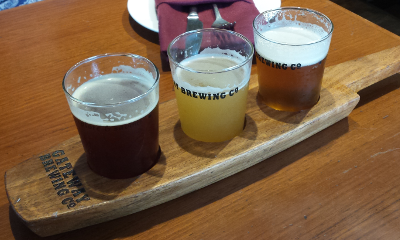 Today I’ll rate the beer flight we had from Gateway Brewing, located in Dombivli. The flight included the three Gateway beers Woodside has on tap: an English-style IPA and two German wheat styles, a light and a dark. First up was the White Zen wheat beer. It pours an opalescent pale golden yellow with a bit of creamy white head which forms a nice lacing on the glass. The aroma is light, but there’s a noticeable banana character and a hint of clove. The flavor is clean and quite refreshing on a hot day, with a smooth clove character and a bit of sweetness that fades away quickly. The palate is light and active, making for an easy drinking beer, but it asks for just a bit more flavor. Next we tried the Doppelgänger dunkelweizen, a fairly hazy dark ruddy brown with a little off white head. The aroma is mild, with some caramel and a bit of nuttiness. The flavor, while somewhat flat, is refreshing as well, but otherwise unremarkable. The mouthfeel is creamy and there’s a hint of cloying sweetness at the end. When tasting it I didn’t even realize it was a dunkelweizen, mistaking the mild flavor for a German-style dark lager. 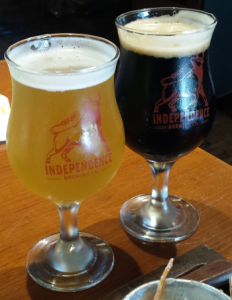 Finally we had the India Pale Ale, with its distinctively floral English character. Their IPA pours a barely hazy cupric gold color with some bone white head. The light aroma is mostly hops, a light herbal and floral nose. The flavor is likewise mostly floral hops, with hints of biscuity malt character spicing things up. The palate is also light and refreshing, but the carbonation ends up being a bit too harsh. Before long it will be 14 February, so it’s about time I get around to enjoying my Enjoy By 02.14.15 from Stone Brewing Company in Escondido, California. I was in Denver the week after Great American Beer Festival, and during my time there I had plenty of the Enjoy By 12.05.14, so I’m looking forward to this incarnation of the double IPA. Enjoy By pours a brilliantly clear straw color, with just a hint of caramel highlights. The head is bone white, not all that hefty but lingers. A gentle floral aroma wafts up, while citric fruity notes are there for those looking for them. The light and delicate nose probably wouldn’t stand up to much aging, in keeping with Enjoy By’s freshness mantra. The flavor is big with bold fruity, floral and earthy herbal hop flavors. Hibiscus and mango are followed by a bit of spicy pine. A light caramel malt flavor and full biscuity character balance the hops perfectly. A full body and an alcohol warming bring a punch. The bitterness is present, but not forward, so the Enjoy By doesn’t read like your typical double IPA. Instead, it has a warm and comfortable character, packed full of fresh hop flavor. 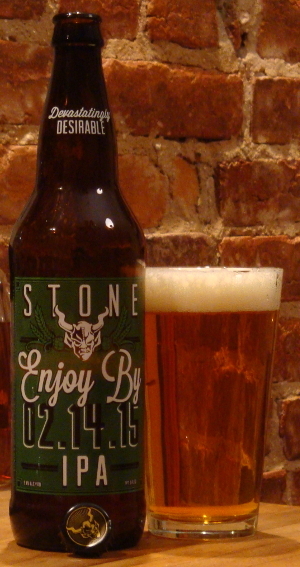 Stone has since released an Enjoy By 03.14.15. I’d suggest you find some and drink it now, I sure am going to. We had a wonderful brunch this afternoon at Meridian Pint. 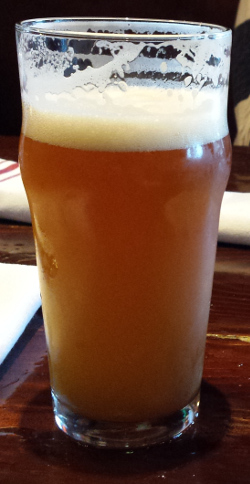 Afterwards I tried the Maniacal Double IPA from Port City Brewing Company in Alexandria, Virginia. Maniacal pours a hazy goldenrod color with a thick, creamy off-white head. The nose is big with fruity and herbal hops: grapefruit, mango and some pine. There’s just a hint of bready malt character. 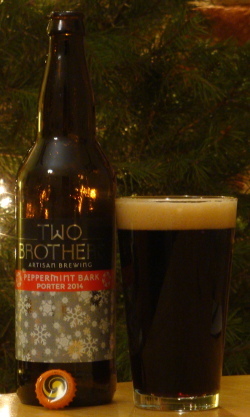 The bitterness is immediately rich, but it’s balanced by a robust malt flavor and a bit of alcohol warming. The hops are not just bitter, but also quite flavorful. Herbal pine, fruity grapefruit and tangerine, and even a bit of floral rose. The body is strong yet sort of rolls off, so the Maniacal stays very drinkable. There’s just a bit of floral hop flavor that lingers, begging for another sip. 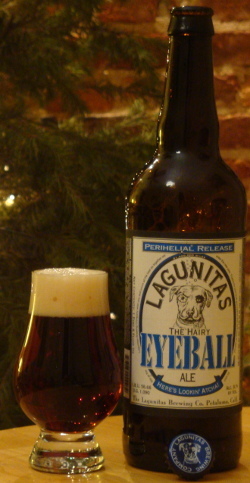 I’m capping off this year’s Twelve Beers of X-Mas with The Hairy Eyeball Ale from Lagunitas Brewing Company in Petaluma, California. This is their celebration of the planet Earth’s perihelion, which occurred about a week ago. The Hairy Eyeball pours a relatively clear ruddy amber color. A creamy off-white head leaves a solid lacing on the glass. The nose is light, with a sweet toast and caramel malt character. A bit of alcohol spice and a little earthy hop aroma add some complexity. As it warms more dark fruit comes out on the nose. The flavor is rich in malt character, covering the spectrum from biscuits and bread to toast, caramel and toffee, with even a hint of roast malt bite. The alcohol is evident, providing a strong warming without going overboard. The malty sweetness is nicely balanced by a robust bitterness from substantial hopping, which also contributes an herbal and earthy hop flavor. The generous malt also gives The Eyeball a thick and full body which is balanced by a lively carbonation, keeping it quite drinkable. With its strong alcohol and rich malt, this may indeed be a good beer to use to recover from a hangover. One of the few all-wild breweries in the United States, Jolly Pumpkin Artisan Ales in Dexter, Michigan ages every drop of beer in oak barrels. The process is labor intensive, and not just because it requires handling barrels that weigh upwards of 100 pounds (when empty!). Extensive blending is needed to get any consistency, a process made all the more difficult with short run offerings like the 2012 Noel de Calabaza I’m tasting tonight. The Noel pours a deep mahogany brown, darker still due to the heavy haze. The creamy sandy brown head lasts and lasts. The aroma is subtle but complex – a delicate malty and fruity sweetness is composed of caramel, raisins and plums, and an earthy, barnyard brettanomyces funk peeks out from behind, growing as the beer warms. The flavor is alternately sweet and funky. Toffee and caramel combine with plums and figs, with an herbal hop character holding its own. The earthy, almost sweaty wild yeast character tickles the sides of the tongue while the sweetness soothes the top. A light sour and a bit of a smokiness round out the taste. Just as complex but not quite as subtle as the nose, the flavor fades a bit towards the end, allowing the alcohol to come to the fore. The body remains full but due to the brett it finishes quite dry. 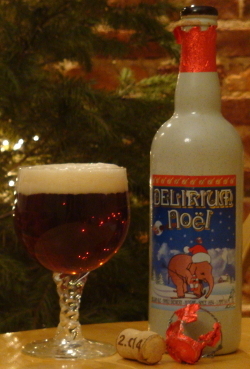 This evening I’m having Delirium Noël, the Christmas offering from Brouwerij Huyghe, based in Melle, Belgium. The delirium line (originating with Delirium Tremens) features delightful pink elephants as the logo, in this case they’re skiing and driving Santa’s sleigh. Noël is a relatively clear ruby red, with a thick, creamy and lasting tan head. A delicate caramel malty sweetness leads the nose, followed by a spicy, peppery character. Coriander, cinnamon and white pepper combine with dried fruit to produce an amazingly intriguing complexity. A rich spiciness dominates the flavor. Strong alcohol warming melds well with the cinnamon and allspice, an almost overbearing spice character that is somewhat balanced by a rich caramel sweetness. After the depth of the aroma this hammering flavor is a little frustrating, but I suppose in a way it’s the Belgian version of an American IPA. The full body, the alcohol bite and the bright carbonation produce a lively body that makes this beer remarkably drinkable for how sharp it is. This is almost the definition of a winter warmer: the spiciness, the full body, the high alcohol content (ten percent!). I wish there were a bit more depth to the flavor, but otherwise a very satisfying beer to share on a cold night like tonight. 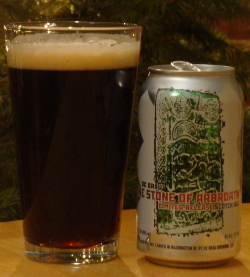 From DC Brau here in Washington, DC, I’m tasting The Stone of Arbroath. This Scotch wee heavy, the winter seasonal from DC Brau, is named after the Drosten Stone, a mysterious Pictish stone with an usual inscription in Roman script. The Stone pours a deep sienna brown bordering on black. The buff-colored head is creamy and thick, falling quickly but leaving a good lacing. The nose is light but complex, led by a sweet malt character of toast, chocolate and caramel. Dark stone fruit like plums follow, joined by a hint of banana ester. As it warms the sweet dark malt character grows more predominant. The taste is surely rich and sweet, but somehow remains relatively balanced. Dark malt flavors blend with kettle caramelization to produce a robust toasty, roasty and sweet character. The full, creamy body is balanced by a strong alcohol warming and barely noticeable grassy hop bitterness. The roast character borders on a stout but the full sweetness keeps the burnt flavor at bay. At first it seems this beer will be cloying, but the sweetness fades away quickly, yielding a balanced flavor. Yet the body never completely dies, ensuring that the spicy alcohol and roast malt character remain balanced to the end. This is a beer my father, a lover of stouts, would quite like. 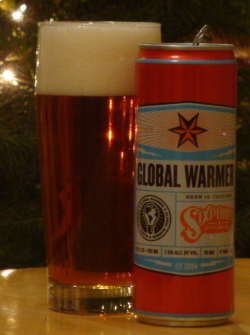 Tonight I’m having the Global Warmer from Sixpoint Brewery in Red Hook, Brooklyn. 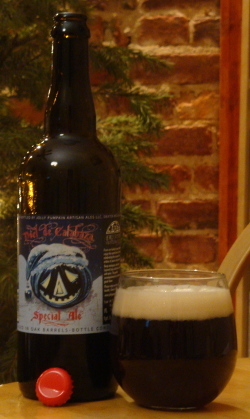 This imperial red ale is a playful take on the usual winter seasonal. Like many of Sixpoint’s labels this one features tongue-in-cheek copy, here poking fun at the strange seasonal calendars of breweries and retailers. The Global warmer is a crystal clear goldenrod with the faintest red highlights. The generous creamy head is just off white and leaves a nice lacing on the glass. The aroma is full, leading with a rich hop citrus and supported by biscuity malt notes. Oranges and lemons are joined by a bit of an herbal hop character. A hint of caramel rounds out the nose. The taste is intensely but not excessively bitter, with rich grapefruit, orange and pineapple flavors. A caramel and toast malt sweetness attempt to balance the hop bitterness, but don’t quite make it. The sweetness fades leaving something of a lingering bite, but the body remains full. There’s a bit of an evident alcohol character at the end. The nose on this warmer is rich and intriguing, but the flavor may be overly bitter. The Global Warmer comes in the new 12 ounce cans rather than Sixpoint’s usual sixteeners, and that’s probably a good thing.